Looking Back at a Legend | American University Washington D.C.
Civil Rights Movement icon Julian Bond remembered as a leader and educator. With the death of Julian Bond, the world mourned the loss of a civil rights pioneer and social justice champion. American University also lost a teacher, colleague, mentor, and friend. American University President Neil Kerwin and School of Public Affairs Dean Barbara Romzek offered their thoughts on Bond's legacy in August. On Tuesday, October 6, a private ceremony was held for Bond in Washington, and now we've collected additional memories from various members of the AU community. As the edited comments below demonstrate, Bond was an inspiring and beloved figure on campus. I first met Julian Bond on February 2, 1996, the day that I interviewed for my position as a professor in the Department of Government. Part of the interview took place during lunch, in the Faculty Club. Julian had arrived there before everyone else, and he was already seated at the table when we arrived. I had never met him before, but had heard so much about him from the time that I was a child. I was quite flattered to see this civil rights icon taking time out on a very cold and snowy winter day to meet me. After the luncheon, I talked privately with Julian for several moments and expressed to him the admiration that my family had for him. The next time that I saw Julian was seven months later, when we were colleagues in the Department of Government. Julian taught on Monday nights, and every Monday that I worked late, I stopped in to see him during his office hours, provided he was not busy in meetings with students. That last condition was rarely met;many students lined up at his office to talk with him. He was very popular, and his classes always filled up. Nevertheless, I did manage to talk with him many times, and we discussed the current political situation. In one of those conversations, held in the fall of 2007, Julian predicted that Barack Obama would win the presidency the following year. At that time Hillary Clinton was way ahead of him in the polls. I assumed that even if Sen. Obama did win the nomination, he would not be able to prevail in the general election. Julian told me that he definitely could win the nomination and the general election. He clearly had his ear to the ground and could discern public opinion better than I could. It was that insight and intelligence that made him a great professor and a legendary leader of our era. Generations of students at American University benefited from his knowledge and his commitment to social change. Julian Bond was a great American and wonderful teacher. A great Malian historian once said that when an elder passes away it is as if an entire library burned. Indeed the passing of Bond is the passing of important history, knowledge and lived experience. His legacy of civil rights work and community engagement remains as relevant and critically important today to civil rights and racial justice challenges as it is was over fifty years ago. It's hard to believe he is no longer with us. Professor Bond was a teacher, a mentor, and honestly, a father figure in my life. Since I am an immigrant, he connected me with a number of people who helped with my documentation. Not only did Prof. Bond live an iconic life of activism, he lived a life of love. From the first moment I stepped into his classroom at American University to the moment I saw him receive his lifetime achievement award from the Midwest Academy, he exuded passion for his work and all those who crossed paths with him. As a mentor, he instilled in me that dedicating my life to the service of others was the only way I could change the world. He also taught me something that has gotten me to where I am now: Storytellers are needed in our movements because storytellers capture history and touch people in ways that policy never will. Although hearing the news of Prof. Bond's passing left me with a heavy heart, I know that he will always be a guiding light to me and to the many people he has touched through his work. As I continue to push forward, I will hold all of Prof. Bond's lessons near to my heart, and I will continue building his legacy through the power of storytelling. One of my first decisions when I became director of our University Honors Program in the fall of 1995 was to ask Julian Bond to create an Honors Colloquium, Oral Histories of the Civil Rights Movement. Thinking back on the many decisions I made during my 16 years as director, it was also the best. Professor Bond's course, which continued every fall since 1995, inspired hundreds of our best students. For these privileged students, the seminar was a journey back in time with one of the leaders of the civil rights movement from the past, and as chair of the NAACP, one of the most influential thinkers of the present. Dr. Bond appeared at countless Honors events to help build a community of scholars at American University. It was always a treat to introduce him as the only AU professor who ever hosted Saturday Night Live! Above all, Professor Bond was a master teacher who enriched the academic lives of all the students he taught, often leading to Honors Capstone research projects and years of mentorship. I remember the first time I met Professor Bond, my classmates and I all had to do a double-take. He held a remarkable presence in the room. He evoked a certain excitement in students, even as he aged. He spoke with charm and timeless wit, even when discussing some of the most horrible mistakes in American history. In fact, his charm was most robust when discussing the most wicked atrocities of the Jim Crow American South. As a student, the most valuable lessons to be taken from Professor Bond's teaching were not the facts of the civil rights movement in the 1960s. More intangibly, Professor Bond gave us a glimpse of the spirit of the civil rights movement. Bond was able to channel blind passion into sensible and practical reforms. This was invaluable advice for his students, as they began to embark on their own civil rights struggles today. AU was fortunate to have such an incredible American in residence. Professor Bond once remarked to the class, "It's all laugh or cry. You're gonna cry too many times, so you have to laugh when you can. It's good for you." His jovial spirit continues to inspire, forcing me to give serious attention to injustice wherever it may be found. *This is excerpted and edited from Magee's Facebook post. I'll never forget what Professor Bond taught me: that everyone has a story. Whether it's the one that will be on the news or the one that stays with just one person, everyone has a story. It's our privilege to be able to go through life learning and discovering the stories of others. The memory that sticks with me today is seeing Professor Bond dance around a classroom in Ward, as he shared his favorite songs of the civil rights movement with us. I am so, so grateful that he shared his story with AU students in the way that he did, and I know that his story will continue to inspire people for generations. 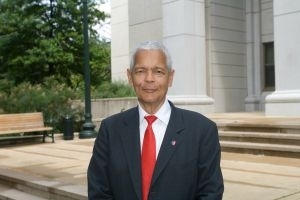 Julian Bond was a friend and colleague in the Department of Government at AU. All of us mourn his passing. He was an icon in the fight for social justice and human rights, but he was always warm, accessible, and giving to hundreds of AU students. Every semester he taught, I had students tell me how much they enjoyed his classes. Julian's national prominence never got in the way of his taking time for his students and for his fellow professors. He personalized the dramatic history and politics of civil rights for everyone in his classrooms. He loved teaching and it showed in all of his classes. He was also generous about speaking in other university forums, such as those sponsored by the Center for Congressional and Presidential Studies. I will miss his wonderful sense of humor, his wisdom, and his friendship. I met Julian Bond several years ago at one of our first Provost's Retreats. He was speaking after the screening of a documentary about apartheid in South Africa, and he followed me out of the conference room to answer the question I said I had, though there had not been enough time to answer. That, to me, was the essence of Julian Bond: He was always gracious and generous with his time, and he never carried himself like a civil rights icon. He was interested in what you had to say, whether you were a student, professor, or someone at a public event. In 2011, I was honored that Julian agreed to be our sole guest for an American Forum TV program on the civil rights movement and the legacy of Dr. Martin Luther King, pegged to the dedication of the new MLK statue in DC. I gathered some 15 students from SOC, SPA, and other schools for the program, which the School of Communication produced for NBC4 TV. I wanted the students to know that, in addition to his other accomplishments, the distinguished man before them had co-founded the Student Non-Violent Coordinating Committee, worked with Dr. King, had been a member of the Georgia legislature, and opposed the Vietnam War. He did all of this in his 20s—i.e., when he was their age. The students did their homework and asked good questions. We engaged in a wonderful conversation about the legacy of Dr. King, the role of women in the civil rights movement, Bond's role in getting media coverage for SNCC, as well as the problems facing the country today and the role of social activism in solving them. Two of the students were community activists in DC, and they talked with Julian about their frustrations in organizing and the re-segregation of DC schools and their hometowns. When we talked about the role of social media today, Julian challenged the students to think about whether posting a comment on social media is activism. He thought they should be out in the streets, immersed in pressing issues such as minimum wage and income inequality. But he also wanted to hear how they use and view social media. During the program, Julian cited a study by the Southern Poverty Law Center, a group he co-founded. He noted that young people's knowledge of the civil rights movement had been found to be largely limited, as he put it, to Rosa Parks and "I Have a Dream." Julian was wonderful with the students, and I am so proud that we have this record of his work with American University. NBC4 TV played the hour-long program many times, and the Southern Poverty Law Center promoted it as a resource for high school history teachers. I feel deeply honored to have known Julian, and I am saddened for us and for our nation that he is gone. We are privileged to have had him among us at AU, and his legacy will always live on, here and around the world.